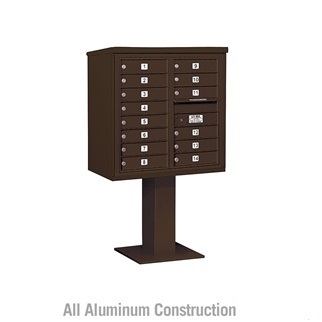 4C pedestal mailboxes are made with the same stainless and aircraft aluminum construction as the F Series cluster box unit and recessed mounted 4C horizontal mailboxes. Vandals and thieves will draw attention to themselves if they attempt to break into this mailbox and are sure to move onto easier targets. The 4C pedestal mailbox requires local postal official endorsement because it is 4C horizontal mailbox mounted on a pedestal. 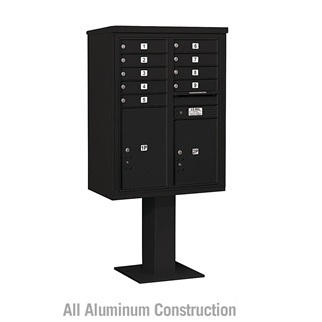 All 4C pedestal mailboxes are warranted for both interior and exterior conditions. 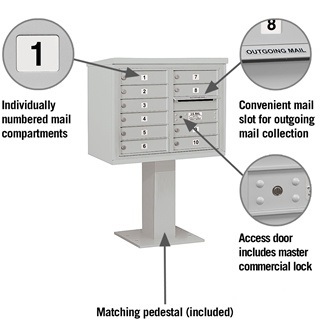 The ten locking compartments on this 4C pedestal mailbox are 13 ¼"W x 3 ¼"H and are equipped with a high security cam lock (3 keys) which is factory installed. 4C pedestal mailboxes are front load for the tenants and mail carrier. This pedestal mailbox has a master control door that is also the outgoing mail collection compartment. The outgoing mail door is equivalent to two 3 1/4"H tenant doors with a 10 ¾"W x ¾"H mail slot marked "Outgoing Mail". A weather protection hood prevents rain, sleet, or snow from entering the compartment. The overall dimensions of the unit are 32 ¼"W x 51 5/8"W x 19"D. Custom configurations are available for 4C pedestal mailboxes. Choose from six different powder coat finishes. A matching pedestal of 26" tall is included in our pricing. (+$45.00) Custom engraved door identification for 4C pedestal mailboxes offers the customer a permanent clean door identification. The engraved characters on your compartment doors will be silver with this door identification option because the unit is manufactured from aluminum. (+$45.00) Custom black filled engraving adds a touch of class to your mail receptacle. Each 4C pedestal mailbox door is engraved with the characters you specify and then filled in with a black ink to further distinguish the door identification.